Kate took a shaky breath while rising from her botched bow-turned-curtsey, and replayed the last phases in her head. Several wrong turns and blundered steps, and a complete gender mishap from trying to mirror the dance master’s movements had marred her performance. She glanced at the master’s narrowed eyes and perceived disapproval. Kate’s heart sank. She so badly wanted to do well. 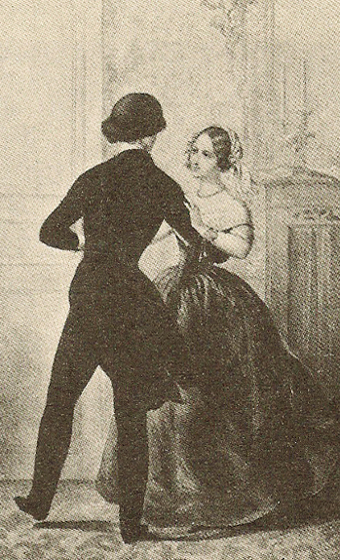 After several lessons with a group of girls (some as young as eight years) it had been decided that Kate needed private instruction with a dance master. She certainly understood the music; she felt it, she stepped with the beat, but following the proscribed steps eluded her, no matter how she tried to remember. Wild reels, with very little restraints, county dances, and waltzes, those she could manage. “Perhaps a waltz?” Kate suggested gently, gliding slowly toward Mr. Pettesworth, who posed near the quartet, examining himself in a full-length mirror. “A waltz?” Please? You always give genuine praise after a waltz. I love being in your arms, guided by your body, the intimacy. The dance master stood with perfect posture, lithe and refined, long carefully coiffured blonde hair framing his clear complexion. Kate saw his large light brown eyes shift from his image to her as she drifted cautiously into the background reflection of the mirror, her pale yellow taffeta in high contrast to his very dark red velvet. Kate thought he looked angry, then his features softened, and as he turned to face her a grin emerged upon his smooth face. He nodded to the quartet, who quickly held their bows at the ready. Kate couldn’t help but smile, and stepped into Mr. Pettesworth’s waiting arms, the scent of lavender filling her nose. The music started, and the couple whirled around the chamber, one-two-three, one-two-three, one-two-three, Kate happy and light. She perceived the elasticity of their bodies with each step, an effortless synchronicity. All too soon it was over. Kate swirled to a stop, shifting her shoulders, dipping her head with batted eyelashes. Someone amongst the quartet coughed. As though on cue the small frame of Kate’s maid, Isabel, appeared in rapid portions as she ascended from the street. She stood at the opening of the staircase, holding her handbag and Kate’s bonnet and shawl. “Thank you, for your instructions,” Kate said. Kate curtsied, then, after a gaze upon the dance master’s fine form, minced gracefully through the rectangles of sunlight to Isabel. The maid smiled. “How did it go?” Isabel asked while helping Kate with a light silk shawl. Kate perched still and silent as around her the chatter bubbled and boiled with each new subject. The Lovelaces hadn’t balanced their table; ten gentlemen and six ladies. The men controlled the conversation with constant sidebars and observations. Kate’s position was far from her father and step-mother, but close to Countess Ada Lovelace who guided her end of the table with quick wit and measured encouragement of each diner, except Kate, who she left alone, clearly recognising her inexperience. Kate, bewildered by many of the topics, kept her movements to a minimum, happy to remain unnoticed, then her luck ran out. “What do you think, Lady Kate?” Mr. Xavier Roylance, a gentleman beside Kate, asked. Kate turned her head to give Roylance, seated to her left, a quick study. He’d been introduced when they arrived as a financier, but the social period before dinner hadn’t afforded fair consideration. Kate thought he must be in his late twenties, well built, exquisitely attired, and he possessed a friendly face with kind eyes. Kate knew the Crosse family from childhood, as their country estate, Fyne Court, wasn’t far from Quantock Hall. A comment uttered roughly a year previously by Countess Lovelace about John made Kate wonder if there might be something going on between them. She glanced down the table at William King, the Earl of Lovelace, and saw him in deep conversation with her father, Lord Beaufort. “How is your father?” Kate asked John, knowing the man to have suffered melancholia last spring. She had wanted to ask since dinner started, but refrained from saying more than two words together through the courses. “Ah, as always, you are far better informed then me.” John beamed warmly at Countess Lovelace. “Of course I am,” Countess Lovelace replied flippantly with a little smile. Kate now turned her head right to give Baron Ward some consideration. She had sat rigidly during dinner and only stared at her food, or furtively peeked across the table at Mr. Crosse, the middle-aged Mr. Michael Faraday, and a staid Scotsman, Mr. Thomas Graham, who mumbled with Faraday about chemicals and gases. Mrs. Faraday, seated well out of Kate’s view to the right of Lord Ward, prattled happily about Christianity and a recent event where her husband met the Prince Consort. Kate could hear Jane asking polite questions, guiding the limited female conversation at the other end of the table. Baron Ward grinned at Kate with twinkling eyes, black curls cascading to his collar. “Are you in London often?” he repeated. Michael Faraday 1842 by T. Phillips, Thomas Graham circa 1845, and William King the Earl of Lovelace circa 1840, when he became Colonel Commandant of the Surrey Yeomanry Cavalry. All were gentlemen scientists. “To the drawing room,” Countess Lovelace announced, rising to her feet. Surprised, most of the men hurried to stand. “There are two more courses,” Earl Lovelace, who had remained seated, said plainly. Kate’s stomach tightened. Musicians for… dancing? Gaming tables… for gambling? She rose (both Roylance and Baron Ward attempting to help with her chair) then turned to her step-mother, longing for security, but Countess Lovelace grabbed Kate’s arm and strode from the dining room into the corridor. Kate concentrated on her posture, the décor passing in a blur. They climbed a staircase, swept along another corridor, then entered a large irregularly shaped drawing room. Countess Lovelace let Kate go and marched towards a group of musicians. Jane, huffing a bit, bustled up behind Kate. The other ladies followed, and a few of the gentlemen. Kate nodded vigorously, her nerves frayed. Find me somewhere to hide! “That looks promising.” Jane motioned towards a corner chamber. “Ada?” she whispered louder. “For the ladies?” She approached and pointed to the door. Kate followed Jane into the room and shut the door. Two windows let in the last streaks of day, several lamps lighting tables of pitchers and basins and mirrors. A closet built into a wall housed shelves of chamberpots. They quickly relieved themselves. Kate trembled as she stood in front of a mirror. “Why isn’t there a maid to help us?” Jane asked the air. Kate glanced at her padded and pushed up bosom, the pale green ruching and lace bertha of her bodice, her constricted waist of perhaps twenty inches. When they stepped out, a maid stood waiting. She curtsied with a blush, and hurried into the chamber. Servants placed trays of desserts upon a table. Countess Lovelace ordered the footmen to fetch champagne, brandy, and coffee. An archway revealed a room with fly-chairs surrounding small tables, neat decks of cards set upon the playing surfaces. The musicians tuned their instruments. Kate took it all in with a growing feeling of dread. No one sat at the piano. Perhaps I could play piano all evening? How long do we have to stay? She scanned the room. Father must still be downstairs. When I see him, I’ll claim a headache and beg to go home… Kate noticed Baron Ward coming her way. She stood to her tallest, shoulders back and down, lowered her eyelids, raised her chin, sucked in her cheeks, and slightly puckered her lips. “I promised my father my first dance,” Kate replied. Oh! That was brilliant! Maybe he won’t come upstairs! “You did?” Jane asked with an arched eyebrow. “Yes,” Kate agreed, instantly recognising Jane’s strategy. If promises were made for certain tunes, of dances Kate knew, the various gentlemen would leave her alone during the other dances. If four out of the other five ladies present danced the quadrilles, Kate could avoid the embarrassment of failure. But what if two ladies decide to play cards?! Should I play cards to avoid dancing? I know nothing about gaming. How much money is involved? Would Father give me money for cards? Is there card playing without gambling? The band started a quiet haunting melody, something unlikely to hamper conversation. “And you’ll promise me a dance, too?” Baron Ward said to Jane. Kate watched as Earl Nelson and his wife, by far the youngest couple present, entered the games room with the Marquess of Northampton, the eldest gentleman attendee, a widower and current President of the Royal Society. Countess Lovelace followed them. Drat! Two ladies playing cards already? Jane and Baron Ward laughed. Kate remained straight-faced, fearing the possibilities. She saw her father enter with the gentlemen scientists; Faraday, Graham, and Earl Lovelace. Countess Lovelace, full of energy, emerged from the games room and walked briskly to her husband. 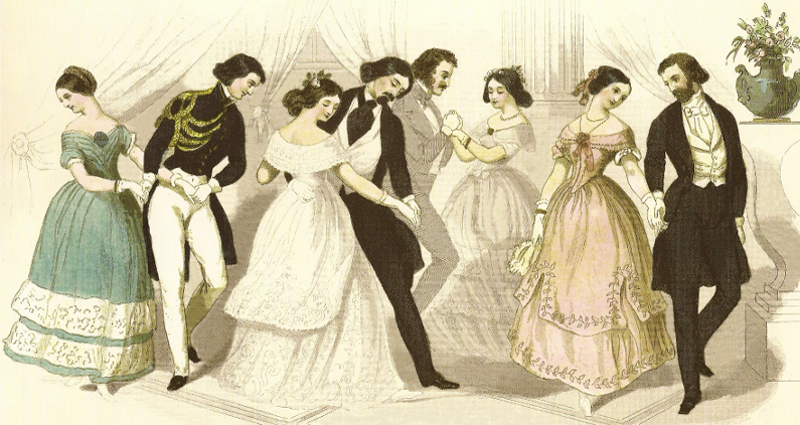 Godey’s Lady’s Book, Oct 1845, depicting couples executing four different steps of a quadrille. Normally, they would all be performing the same steps as the dance progressed. Baron Ward bowed to Jane. Kate waved to her father. The Nelsons skipped in from the games room. Five couples formed into two lines (the Faradays sitting out) as the band struck up a lively tune and a high-stepping country dance ensued, that Kate actually enjoyed. As it ended, the Marquess of Northampton pulled rank and took Kate for a short waltz, then she did a reel with Earl Lovelace, which was also fun. She asked him about his children, in particular his daughter, Annabella, who Kate counted as a friend. The Nelsons performed a polka for everyone. Kate thought she might be able to learn the steps. She managed to half-smile when Baron Ward waltzed her around the room, sat out a quadrille, enjoyed another country dance with Mr. Crosse, then waltzed with Mr. Roylance. She took a better look at him, and thought all the other men appeared shabby compared to his perfectly tailored evening wear, even her father and Earl Lovelace, who always dressed well. As the waltz ended, Roylance changed step, guided Kate back and forth, into two sweeping spins, bent her backwards, then spun her around and dropped to one knee, leaving Kate in a showy pirouette. People clapped. Kate felt exposed, somehow unravelled, and her face burned. “Excuse me,” she breathed, and glided to the refreshment table, then, when she thought no one was looking, darted into a dark corridor. Kate moved quickly through the shadows and peeked inside the first open door, the music drowning whatever noise she may have produced. She found a masculine sitting room, decorated with weapons and martial paintings, lit by two weak lamps, moonbeams at the windows. She slipped within, eased the door almost closed, then perched on a chair, calming her racing heart, letting her eyes adjust to the dim light. Her corset fought against deep breaths. She burped twice. Kate took a lacy silk handkerchief from a hidden pocket in her skirt and dabbed perspiration from her forehead and top lip. Spotting a mirror, she rose and inspected her semblance; strands of hair fell around her face. As she undid her ribbon to retie her braids and tresses the music swelled momentarily then muffled upon a thump at the door. Kate swivelled from the mirror, startled, and popped her ribbon and handkerchief into a pocket. A tall gentleman stood inside the door, holding a glass and a bowl. Kate glanced sidelong into his kind eyes. No one has ever called me a delicate girl before. She took the glass and savoured a tiny sip. Kate took another sip. This is nice. “See what I have here?” Roylance held out the bowl. Kate hesitated, then carefully took a spot at one end of a couch. Roylance sat immediately beside her, causing Kate to tense and shift a fraction. “What do you mean?” Kate asked, suspicious of his wording. Kate tried to recall everything she knew about such a situation. I’ve only just met this gentleman. He’s wealthy… a friend of the Lovelaces, and he knows Father. I think it’s acceptable for me to sit with him, and talk. I think he may even kiss me, on the cheek, as long as it doesn’t go any further, and if he behaves gallantly. Roylance held the bowl out towards Kate. She took a strawberry, let the cream drip, then popped it in her mouth. “Ah…” Kate set the champagne on a side-table and looked in the bowl. Kate craned her head forward and puckered. She went cross-eyed as the berry came to her lips, kissed the dripping cream, then opened her mouth. Roylance didn’t let go, but moved the berry upon her lips. Kate focused on the man and didn’t like the way he was leering. She recoiled and got to her feet. “How long were you going to do that?” Kate asked, anger accenting her words. Kate felt placated by the flattery. Striking, swanlike… delicate… lovely… I wonder what else he’ll come up with? She took a strawberry and ate it, then another. Roylance smiled and ate one himself. “Don’t forget your champagne,” he said. “It’s your champagne,” Kate corrected. She picked up the glass and offered it to him. The muffled music sharpened and swelled in volume as Countess Lovelace entered the room, throwing the door wide. “Well! Isn’t this a pretty sight,” Countess Lovelace declared with a snicker. “And champagne?” Countess Lovelace stepped closer, smiling crookedly. “Yes, a few sips. Mr. Roylance, your glass.” Kate held it out to the man. “You finish it,” he replied dismissively. “Ada? Have you seen Kate?” Jane entered the room. “Oh! You’ve found her… Kate? Why is your hair undone?” Jane frowned, then stared hard at Roylance, and turned a deep shade of red. “What’s… what’s…” she stammered, her eyes growing wild. “You have a delightful step-daughter, Lady Beaufort,” Roylance said with a smirk. “What’s wrong?” Kate asked, setting down the glass, peering from lady to lady. Icy water splashed through Kate’s marrow. The adults were talking, but Kate discerned only a roaring wind. Her vision blurred. Every muscle tightened, then all bodily sensation vanished. She sprang to the hearth, snatched up the heavy wrought iron poker, and advanced on Roylance. Her heart pounded, her vision cleared and sharpened, her hearing returned. “It’s fine,” Roylance purred confidently. “Calm yourself, girl. Give me the poker.” He proffered a hand. With a flexing of her arm and lightning quick flick of her wrist, Kate delivered a wicked blow on the man’s knuckles. Roylance yowled and jumped away. “Take a weapon and fight back!” Kate growled, pointing to the swords, maces, and axes decorating the walls. “She’ll kill me! She’ll kill me!” Roylance retreated to a corner. Kate chortled against her anger, emotions churning, amused by the allusion to Lord Byron. She sashayed to the hearth and tossed the poker into a hod with a bone-rattling clatter. Kate and Jane strode for the door. Countess Lovelace moved towards Roylance. “She’s broken my hand,” he mewled. “You needn’t whimper so!” Jane called over her shoulder. Kate laughed again… but her eyes clouded with tears.